Snow, rain, and cold winds plagued runners throughout the morning. Thought you might like to hear a recap of the recent Rebel trip to Ocean City, MD. Barbara ran the full marathon (MAJOR acheivement considering the conditions), and Wes, Lori, Claire, Tony, Darlise, and Tricia ran the half. The weather could not have been worse!!! Snow, rain, and high winds. The bridge crossings were certainly interesting! Major kudos to Barbara for not stopping at the half marathon point - when I saw all the full marathoners crossing the bridge, battling a huge head-wind, there was no way I would have continued had I been running the full marathon. It was pretty brutal out there. 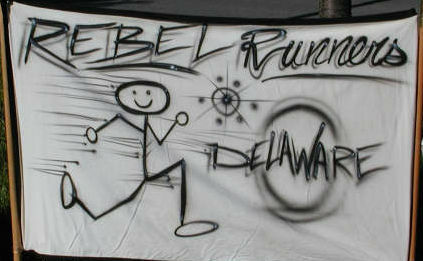 However, we brought some hardwear back to DE - GO REBELS - here are the results!! The General also decided to run the half after finding out that the weather wasn't cooperating. We all agreed we would have done the same thing - but Barbara was clearly on a mission. And many thanks to Jim and Rich who provided support and a friendly face along the way!